BugDoc Dave here. And now….it’s Stretch Tuesday and I’d like to finish my discussion of the handled servers! 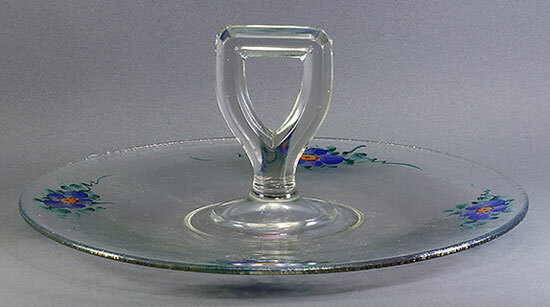 In my last discussion, I covered the looped-handled servers by Fenton and U.S. Glass as well as the heart-handled ones by Diamond and Imperial. Today, I’ll cover what we stretch glass collectors call “shovel-handled” servers. In all of these, the top edge of the handle is straight across. Unfortunately, there are more of these and some are pretty similar, so bear with me. You’ll have to pay attention to the fine details of some of these. Oh, as a reminder, if you have a dolphin-handled server, it is from Fenton. In my mind, the easiest two shovel-handled servers to identify are Northwood’s and Imperial’s. Northwood’s handle has a very short stem and a relatively wide top. This one comes in the normal Northwood colors of Topaz, Blue (both a Celeste Blue type and the sapphire-blue type), Russet and a marigold (we don’t know the Northwood’s name for this). Conspicuously missing is a Jade Blue (the opaque blue color) example. The vast majority of the Northwood servers are the sandwich tray shape (straight out), but a couple are known with the edge pulled up into the fruit tray shape. The Imperial server is also pretty easy to identify as the hexagonal-sided stem extends all the way to the base of the bowl. These servers come on only three of the Imperial stretch colors – Iris Ice (crystal), Rose Ice (marigold) and Blue Ice (smoke). 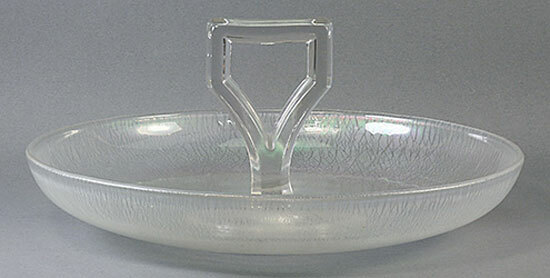 This is a very common server and the sandwich and fruit tray forms are equally common. To make things interesting is that many of the servers have factory cuttings, often of various floral designs. We know the numbers of some of the designs, but we haven’t been able to track down all the design numbers. Most of the cuttings can also be found in all three colors, so you could spend a lot of time and money trying to assemble all the possible items made. 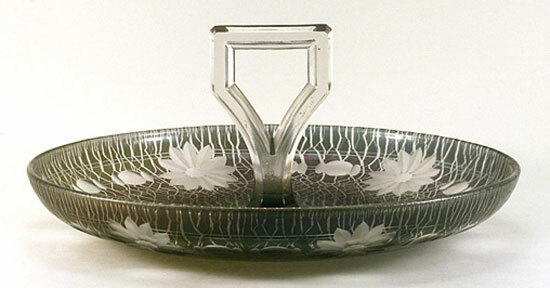 Another easy to identify, shovel-handled server was made by Lancaster Glass (Lancaster, Ohio). 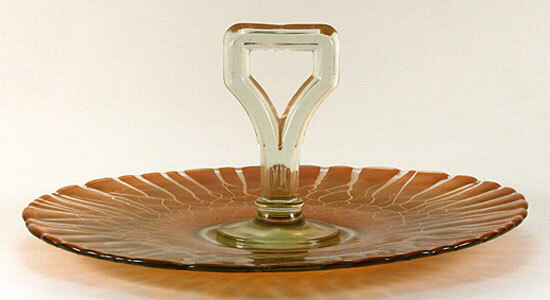 The handle is very thick and is attached to the dish portion with a thin ring. These servers come in a crystal stretch (their Iris Ice) and marigold (two shades, a light marigold called Rose Ice, and a dark brown marigold called Aztec). Now, we get into the more difficult to identify servers. Jeannette actually made two servers. One is fairly easy to identify as it has a very narrow shovel-handle and there is a 16-point star in the base. This most commonly comes in marigold. Jeannette’s other server looks a lot like Diamond’s. Both have a fairly long stem to the handle, and both attach to the base with a thin ring, but the Jeannette one has the sides more sharply squared off. Probably the easiest way to tell these two apart is by the colors. The Jeannette ones are marigold and the Diamond ones will be Green or Blue! The last of the shovel-handled servers is Central’s. This one looks a bit like a cross between Northwood’s and Imperial’s. These are very rare. If you look at the handle, the sides are rounded (like Northwood’s) but it has a longer stem (like Imperial’s). 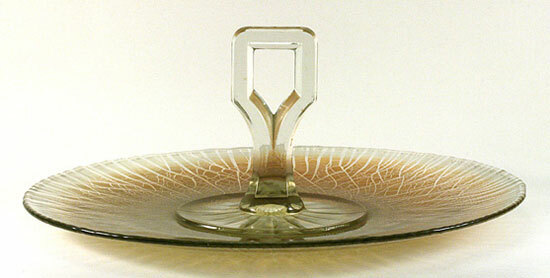 However, the six-sided stem stops above the base and becomes round. The only one that I’ve seen is in Green and it has an acid-etched design.